I will give the guy in the infomercial the benefit of the doubt and assume his recording doesn’t conclude with the sound of a lifeless female body tumbling helplessly into an isolated ditch. I can’t tell you how many times I’ve wanted to listen to a conversation that I was a part of at a later date or how many times I’ve completely forgotten the instructions a doctor gave me about things pertaining to my health. I’m over here listening and committing things to memory like a 20th century chump when what I really should be doing is jamming an over sized pen in people’s faces and recording everything they say so I can listen to it later. Listen to the things “they” don’t want you to know. So it does have a battery though, a rechargeable one, but still a battery. I’m thinking of that poor slob in “Casino” who gets stabbed with his own pen by Joe Pesci… maybe he was trying to record his date before he started mouthing off to De Niro? 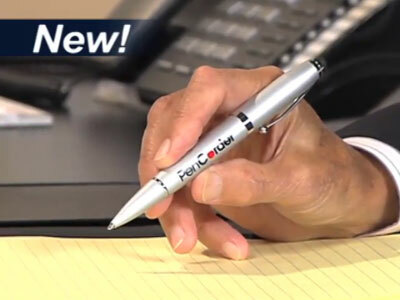 Sure is “discreet”, alright; it says “PENCORDER” right there on the side of the pen!